What lights us up and inspires us to take our game to the next level, is creating wealth with passion and purpose, not only for ourselves but for our clients and investors. Over the past decade we’ve developed millions of dollars in real estate for our own portfolio as well as helped hundreds of clients multiply their wealth through real estate. We’ve been through ups and downs, and made a lot of mistakes in addition to our successes. We’ve participated in real estate from a variety of roles: operators, syndicators, managers, private lenders, educators, teachers, advisors, and coaches. 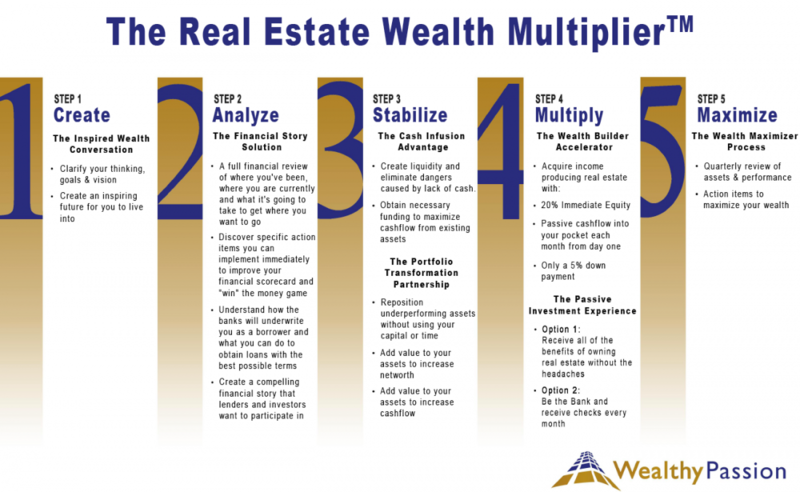 Through our experiences and the experiences of our clients we’ve developed The Real Estate Wealth Multiplier, our unique process which helps investors unlock equity, transform distressed real estate and multiply their wealth in alignment with their purpose and passion. You can check out an overview of our process below and if you would like to download a PDF copy please fill out the brief form below.